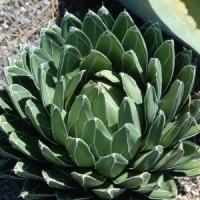 A small agave with cream edged leaves. Thread leaf agave up to 3ft.across and 2ft. tall fully grown. Has narrow blue-grey leaves with the dark spine. A medium-sized agave and one of the most hardy. Variegated century plant.Up to 1.5m high.Tough plant. 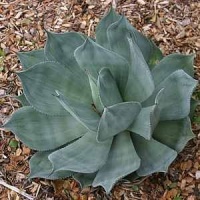 The century plant or American aloe.A large agave tough and easy to grow. Beautiful blue-green agave from Mexico growing up to 60cm. in diameter. Pale blue-grey in colour. Eventually reaching 2ft. high and wide. Stunning plant that is slow growing dense rosette height 20cm. 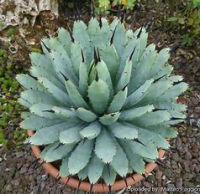 A very attractive small agave with four leaf colours.We grow it in part shade.Available for sale at shows only at present.